Seems that every spring I get the urge to clean, not my house but my websites. This year Living History via Virtual Worlds (LHVW) is the beneficiary of my efforts. Nothing like starting off the season with a few software upgrades, some html coding, and a new flavicon. You can get the full rundown at Site News: Construction & Clean Up 2019. 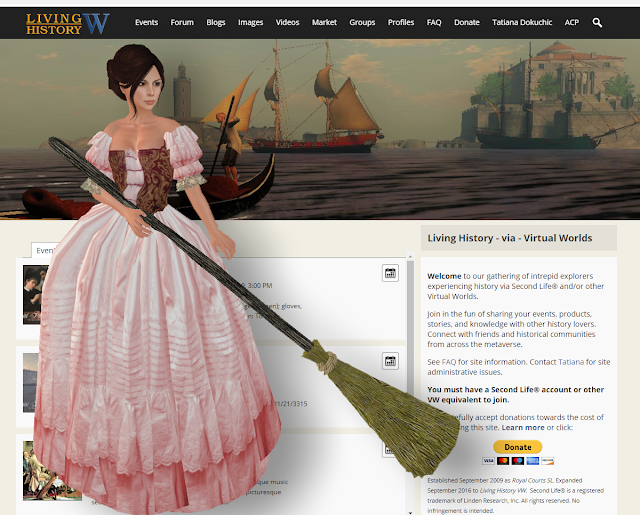 Recent visitors should clear their image cache to see the fabulous new banner image, "Barks & Paddles", by Abbondio. 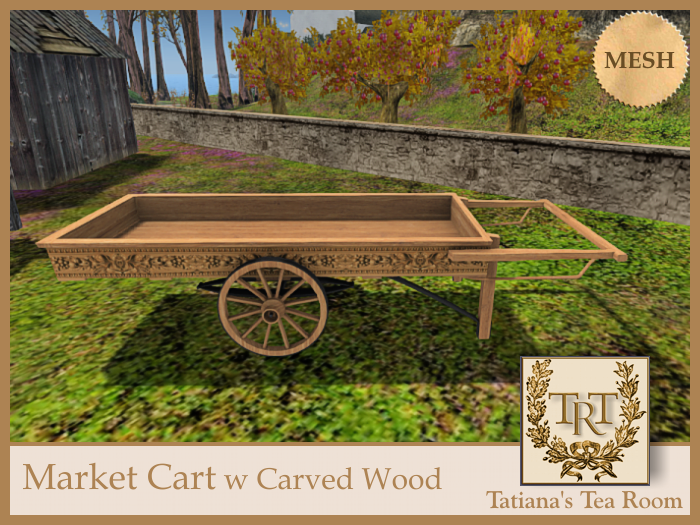 Market Cart w Carved Wood by Tatiana Dokuchic on 2018-10-11 An elegant carved-wood market cart perfect for displaying your wares. This bohemian twist on the classic Louis XVI Chair makes you happy just looking at it! Fresh from the RFL Home & Garden Expo where I believe it generated a bit of good karma by helping to raise money for cancer research. Zen boasts a frame of carved light oak; a cheerful silk, mandala back; and velvet chair seats. Touch the chair back to select from the four different seat fabric colours (Pink, Purple, Green, Blue). Curl up with a good book, relax with a cup of tea, enjoy a glass of red wine or host a sing-along as you play your own guitar,. With 25 animations (unisex, female, male, chat). there's a lot to keep you occupied. You'll also find writing & dining animations making the chair a perfect companion for your own desk or table. 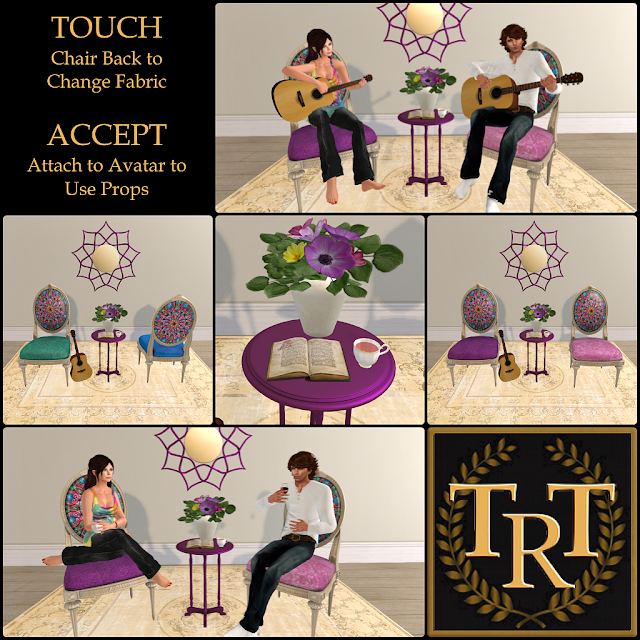 Louis XVI "Zen" Chair Vignette by Tatiana Dokuchic on 2017-07-05 This bohemian twist on the classic Louis XVI Chair makes you happy just looking at it! Here's a project that I've been meaning to release for awhile now; a set of five decorated milk churns perfect for roleplay or home decor. When it comes to Skyrim, I'm definitely a homebody and not a wanderer. I know from experience that being homeless is painful; having to haul ingredients and travel to forges, alchemy & enchanter stations; having to sell my loot immediately. As I mentioned in my last post, one of my first priorities this time around is building a home, adding all the amenities and then sticking to it. I choose Lakeview Manor for its beautiful location. The most southerly of the three homes that can be built, it's also close to my favourite town, Riverwood, and city, Whiterun. Living in real-life Canada, I appreciate a place that's as far away from snow as possible! I love the open world of Skyrim and all the vastness of its possibilities. Unfortunately, as I mentioned in my previous post I'm "a bit of this - a bit of that" kind of person. In my first go-around I found myself spread too thin with regards to my character build and it became a tad confusing. This time I've narrowed down my focus to those things I really love and though I'll probably never follow one of the character archetypes I know it's going to be a lot of fun. Given that I've identified myself as the "Demure Dragonborn" it shouldn't come as much of a surprise that I'd much rather craft than fight. Smithing, Alchemy and Enchanting are not only a pleasure but are going to bring me both wealth and protection. Speaking of protection, I definitely don't want to wander around Skyrim as a defenseless fool. I also want a modicum of magic in my life, I mean who wouldn't! I intend to be fleet of foot using light armor with a sword in one hand and spells in the other. I'm also going to rely on my potions & enchanted items to pick up any slack where my spells and/or skills are lacking. During my initial researching (something I never even thought to do the first time around) I was pleasantly surprised at the wealth of Skyrim Character Builds that are out there. 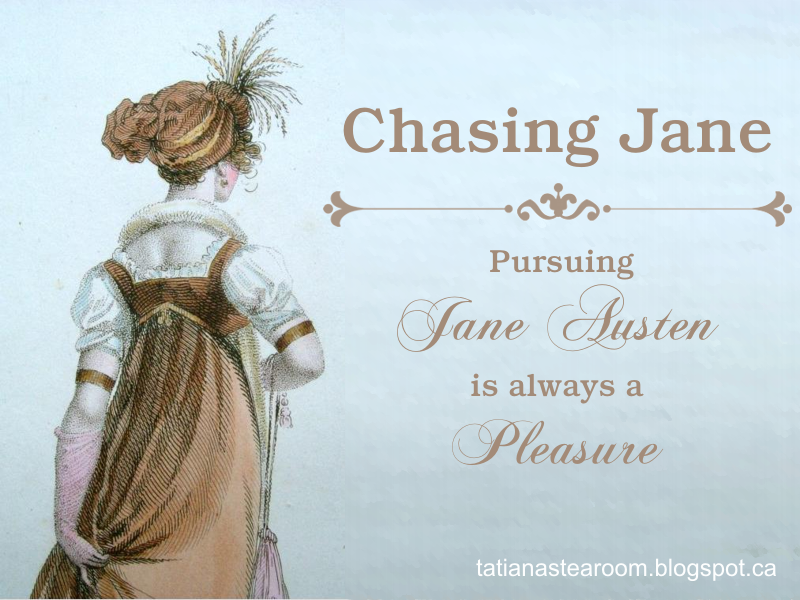 The time & effort people have spent analyzing & documenting their characters is amazing. Hopefully I've managed to incorporate some of the best ideas into my own strategy. IT Architect escapee now working in Second Life & renovating my real life. The final chapter has been reached. Clermont Collection: Back to Baroque.